This article is about the Toa. You may be looking for the Transports. "No. This is my lifetime's journey. Yours lies beyond. I am proud to ... have called you brother ... Toa Vakama." Lhikan was a Ta-Matoran who became the Toa Mangai of Fire, a legendary Toa who guarded Metru Nui, and the leader of his team. After sacrificing his Toa Power to create the Toa Metru, he became a Turaga, but was killed soon after by Makuta Teridax, saving Toa Vakama's life in the process. He has since been revived on the Red Star. Around 3,500 years ago, several Matoran were found dead with tablets reading 'Toa Tuyet'. Tuyet revealed that she had once been in possession of a powerful artifact called the Nui Stone, sought by the Dark Hunters, and suggested that the deaths were a countdown set by the Dark Hunters. Several Dark Hunters attacked Lhikan and Nidhiki, and Lhikan defeated Triglax and Gladiator. After they defeated the Dark Hunters, another Matoran was found dead, proving that the Dark Hunters were not behind the killings. Lhikan then confronted Tuyet, and forced her to admit she had the Nui Stone. The two fought, and Nidhiki arrived to help defeat Tuyet, who was using the Nui Stone. Tuyet rose on a waterspout, which Lhikan froze and Nidhiki shattered. Tuyet lost her grip on the stone and fell, and Lhikan moved to catch her. Nidhiki tried to catch the stone, but Lhikan destroyed it with a blast of fire. They then imprisoned Tuyet in the Coliseum. After dying, Lhikan was resurrected on the Red Star. Here, he was given a replacement Hau. [CwGF] However, the return mechanism of the Star had since malfunctioned, and Lhikan was trapped in the Star, along with other revived beings. Lhikan has command over the Element of Fire, and is able to create and manipulate fire. His many years as a Toa gave him great experience with his element; prior to his transformation into a Turaga, he was known to have very fine control over his powers, being skilled enough to burn tiny symbols onto Toa stones, while many Toa of Fire have less precise control over their element. [B2:LoMN] When he became a Turaga, this power was greatly reduced. As a Toa, Lhikan carried two Fire Greatswords, which could be joined together to form a hoverboard. He used this to fly high above Metru Nui on the lookout for trouble. 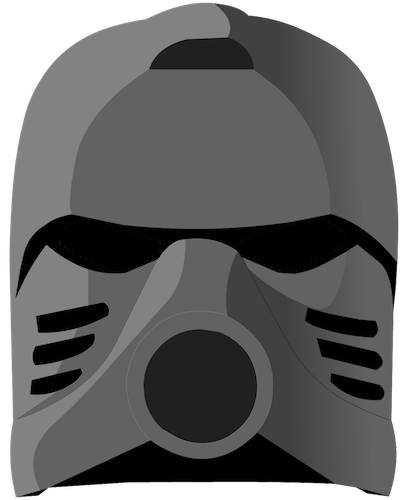 His Great Kanohi Hau allowed him to protect himself from foreseen attacks, but not from ambush. As a Turaga, he carried a smaller version of his Greatswords, which he used as a shield. He also carried a small ceremonial Firestaff that he used as a walking stick and as his Badge of Office. He wears the Noble Mask of Shielding, which protects him from attacks, but is not nearly as powerful as the Great version. 8811 Toa Lhikan & Kikanalo was released in 2004. Lhikan used forty-four of the set's 214 pieces, which included a special edition movie Hau in a gold color. He could optionally ride on the Kikanalo's back, although the two never appeared together in any media. Like in the movie, Lhikan carried Fire Greatswords that could combine into a hoverboard or large shield. "Go with them? But I'm a Toa, Lhikan. I'm your brother in arms!" "No. No, you're not. You lost the right to call me 'brother' when you betrayed us all. Get out, Nidhiki – of my sight and of this city. Get out before I kill you." "You lost the right to call me brother long ago." "Faithful Matoran, Metru Nui needs you. A shadow threatens its heart. Prove yourselves worthy Toa and fear not. The Great Spirit shall guide you in ways that you could not imagine." "Freedom and escape are different objectives, but both are easily realized." "Without self-discovery, you will never find your destiny." Lhikan was voiced by Michael Dobson in Legends of Metru Nui.